Many Ravenswood Manor residents use our local parks, including Ravenswood Manor Park, Buffalo Park, and of course, Horner Park. But did you know that all of our parks need some local “TLC” each year? The Horner Park Advisory Council has a Stewardship Committee, and each year, it seeks volunteers to help keep our parks clean and green. Coming up on Saturday, April 26, from 9-noon, Friends of the Parks will stage its 25th Annual Earth Day Parks & Preserves Clean Up. There are plans to have sites open that day at all of our neighborhood parks, and the captains can sure use a little help! Activities that day may include litter pick up, leaf raking, tree mulching, new FIBAR in the playlot, graffiti removal, and basic gardening. A limited supply of T-shirts will be available for the volunteers. On Saturday, May 10, also from 9-noon, Friends of the River will produce their annual River Day. Although activities at Horner will be limited due to the riverbank restoration, there will still be volunteers needed that day, especially at Jacob and Sunken Gardens Parks. All during the summer, especially in the midst of draught, our trees need watering. The Stewardship Committee is looking for committed individuals who can help water the trees during the summer. Overall, the Horner Park Advisory Council would like to see Horner, and all of our parks “adopted,” meaning that clean ups or stewardship (including gardening) takes place at least four times a year. But stewardship can also mean avoiding littering, or picking up trash as you walk through the park. 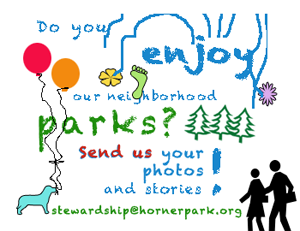 Those interested in helping the stewardship committee should go to the Horner Park website, www.hornerpark.org, to learn more, or contact Stewardship chair John O’Connell at johnroconnell4530@gmail.com. So come on out and lend a hand to your neighborhood park! What’s that fence up for in Horner Park?